There are sannadhis for Govindaraja Perumal in sitting posture and Ranganatha in sayana in which there is a rare idol of Ashthabuja Nrisimha with one hand blessing Prahlada and the other in Abhayahastha and the rest destroying Hiranyakasipu. Sthalapuranam says that this temple came in to being when the Lord gave darshan to Dhruva. The Nagaraja had darshan (Pratyaksha) of the Lord hence the name Nagai. Thaayaar - Parimala Ranganaayaki, Chandrasaaba Vimosanavalli, Pundareekavalli. Access to the temple One can reach the KShetra from Nagappatinam Railway station. It is about 1 mile west of the Station. 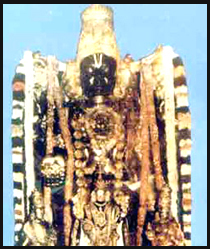 The Moolavar of this sthalam is Sri Neelamega Perumal. The Moolavar is giving his seva in standing position facing his thirumugham towards east direction and having Gadhayudham (a weapon) in his hand. Prathyaksham for Lord Brama, Naagarajan and Thirumangai alwar. This temple lies in the Tanjore district of Tamil Nadu. There's a railway station at Nagapatinam and bus facilities are plenty.